I've been searching for that perfect red lipstick and I think for now my search can be put on hold for a bit. In my Cherry Culture Haul I picked up a ton of new lipsticks and these were two of the reds I really really wanted to try from NYX Black Label Line. I couldn't really find any swatches for the Ruby shade and even tho I wasn't really sure what it would look like I took the chance and ordered it anyway. I'm really happy with both of these shades they are great red colors with only subtle differences between them. 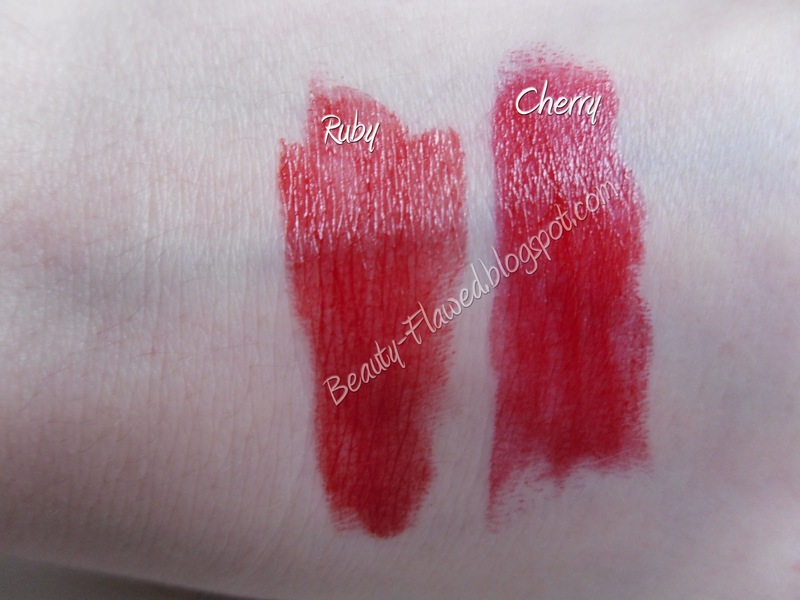 Swatching them was really the interesting part as you can tell in the photo of the tubes Ruby appears to be darker and Cherry more on the brighter red side, however once swatched their true potential really comes out. Ruby is actually a pretty vibrant and true red shade where as Cherry is a little bit darker and leans more toward a blue tone. At first I thought I had mixed the tubes up (they do not have labels on the bottom of them only on the tops of the caps you pull of) but after going over the photos and double and triple checking where I put the caps before taking the photos I came to the conclusion that there was just no way I had mixed up the caps. I'm really really OCD and painstakingly so in this case I guess it paid off. These go on really smooth, have no scent, and are moisturizing as well. They almost have a lip balm like texture and feel slick. They also come off on people and cups and need to be retouched after. If you not eating or drinking they stay on pretty well with little to no touch ups needed. Overall I really like both of the colors and I think for now I'm satisfied enough to stop buying up any and all red lipsticks I see. 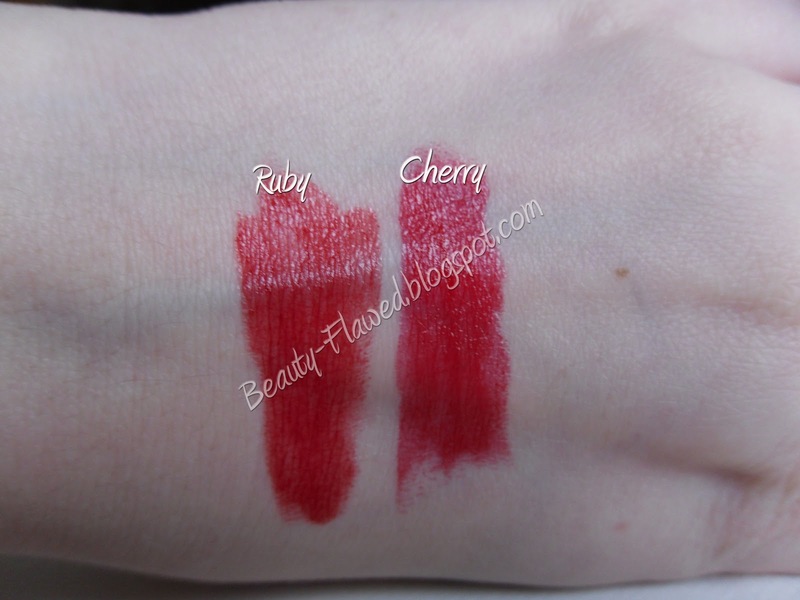 If your on an endless search to find the perfect red lipstick I would suggest checking out these two shades they just might be your perfect red too! 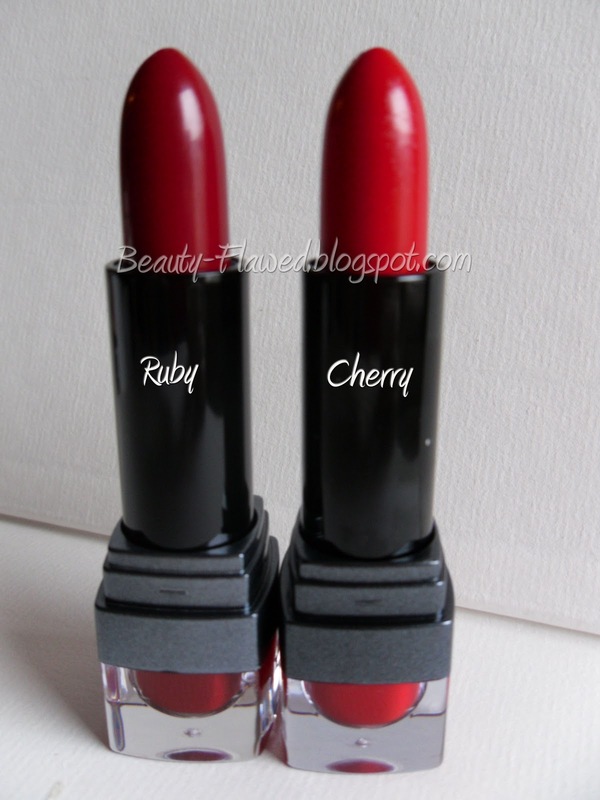 Those are both nice lipsticks, I have been looking for a good red lipstick too, I will have to check these out. Thanks! Great swatches, I really need to pick up some more NYX lippies soon... especially red and pink ones!